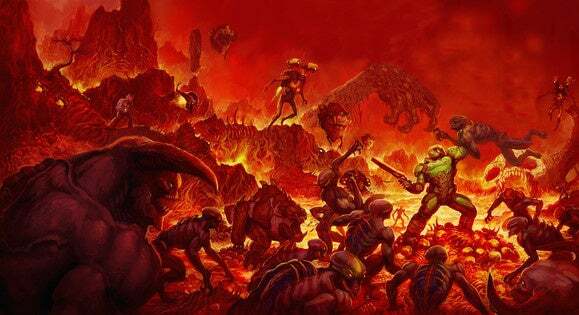 I've heard worrisome rumbles come out of Doom's closed multiplayer beta—the most damning (heh) critiques said it "feels like Halo." Kinder sentiments seem to place it around Quake 3, but with a bunch of modern design shoved into the package. It sounds, in other words, like "Not-a-Doom-game." But soon we'll all be able to see for ourselves. Though the closed beta was limited to anyone who preordered Wolfenstein: The New Order two years ago, Bethesda announced today that an open multiplayer beta is in the pipeline before launch. And it's coming soon—specifically from April 15 to 17. The beta looks like it'll feature the same content as the closed beta, which is to say: Two maps (Heatwave and Infernal) with two modes (Team Deathmatch and Warpath). Bethesda also took the time to announce Doom's DLC plan, and there's a lot of it. A $40 season pass gets you three big ol' DLC packs that otherwise cost $15 each. The first contains three maps, a new weapon, playable demon, piece of equipment, armor set, and some cosmetics. It seems like a decent amount of content but after six months of big-name shooters going the free-DLC route (Rainbow Six: Siege, Halo 5) it feels weirdly 2007 for a game to announce map packs. Hopefully the gameplay's good enough to justify it. Anyway, I'm sure that both my editor and myself will be checking out the beta, however briefly, and we'll report back with impressions for anyone who doesn't have the inclination. Otherwise, Doom is slated to launch on May 13—a Friday, appropriately enough.